The new heating system has been installed in the Parish Centre! Hopefully, all our groups and those who use the Centre will be toasty and warm as the winter weather begins to set in. Many thanks to everyone's generosity to the Building and Development Fund (the second collection) each week. It means we can continue to make improvements on the site that will benefit the parish in the years to come. Do go in after Mass on Sunday to have a look and enjoy a cup of tea or coffee! 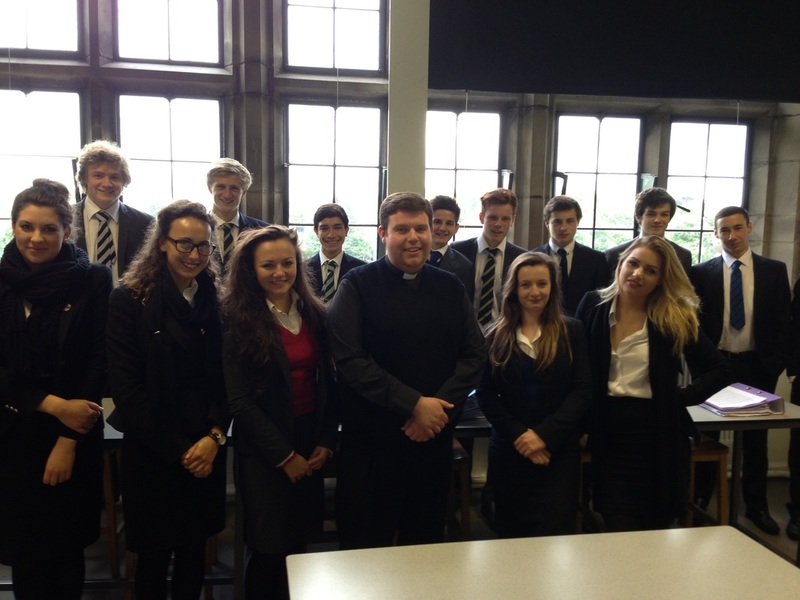 Fr Michael visited Repton School this week to meet some of the Catholic students who attend the school. As part of the visit he helped the school chaplain, Rev. Adam Watkinson, with one of his classes. 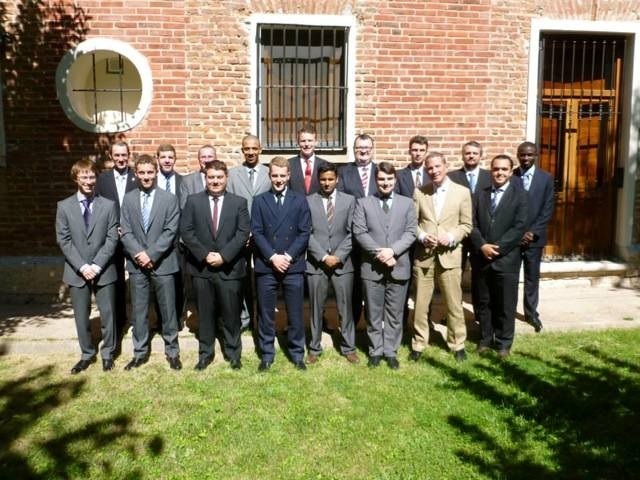 We had an email this week from Alex who is at the Royal English College in Valladolid, Spain. He sends his best wishes and is praying for us all. Keep him in your prayers and pray for vocations to the priesthood. Here is a photo he sent, see if you can spot him. Many congratulations to all those who received their exam results either for AS and A Levels or GCSE, or other qualifications. May the prayers of Our Lady and St Modwen help you use the gifts and talents or our young people to help them to discern their vocation in life. 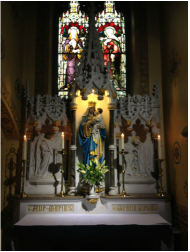 A picture of Our Lady's altar in church from yesterday as we celebrated the her Assumption in Heaven. Mary was always faithful to God and where Mary has gone, we can hope to go. Remember to ask Our Lady to pray for your family and friends. Our Lady Assumed into Heaven... Pray for us! As promised here is a link for Pope Francis' first Encyclical Letter Lumen Fidei. Click here to go to the Vatican website. If you prefer a hard copy, please let the Piety Shop know and we will order a few copies in. This is an amazing document and the work of two amazing Popes to help us celebrate the Year of Faith. Enjoy the read! Now that the summer holidays have arrived, many blessings to those who are travelling. Those staying closer to home, do have a restful and peaceful break. Please do contact one of the priests or contact the Parish Office if you need help finding a place to attend Mass while you are away, we are happy to help! Remember a holiday from home is not a holiday from God. God bless. As you can probably see, the parish website has had a complete makeover! The new site is still in its early days so please be patient with us. In the meantime, let us know what you think or if you have any suggestions or comments let us know. A happy and blessed feast of St Modwen! On Saturday (6th July) the parish came together to celebrate the patron of our parish, our school and the town of Burton-Upon-Trent. In his homily, Fr Stephen said that he is pretty sure that we are the only Catholic parish to have St Modwen as our patron. We are very blessed to have our own saint who walked this town praying for us all. The Mass reflected all the many countries and cultures that are represented in the parish. The readings and bidding prayers were read in different languages. After Mass we blessed the car park, which has now been paid for (thanks to everyone's generosity), then there was a shared table filled with food from all over the world. Many thanks to all who played a part in preparing for the feast. Friday 5th July is the Feast of St Modwen. All the children from St Modwen's School came to church on the bus to celebrate their patron saint. The children served the Mass, read the readings and bidding prayers and led the music. It was a great way to begin the parish celebrations of our patron saint. On Sunday 30th June at the morning Masses bacon butties were on offer to help support Alex, Heather and Fr Michael who will be joining a group of 50 pilgrims from the Archdiocese to go to World Youth Day in Rio de Janeiro, Brazil. Many thanks for all the support. Join us on 14th July for our last fundraiser before we go - a Bring and Buy Cake Sale. You could end up buying a nicer cake than you came with!